This is the recipe my mama always made, and it's the first real recipe I learned how to cook!!! Melt butter and put into a 9x12 pan, or put butter into pan and put into oven while it warms to melt.. Once melted remove pan from oven to add batter. Mix flour and sugar into a medium bowl, add milk and reserved syrup and whisk together.. do not over mix. 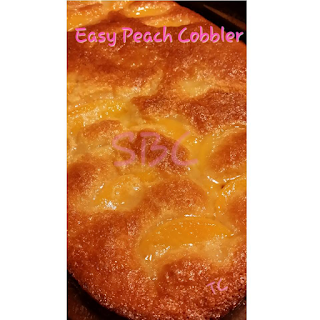 Pour batter into pan with butter, arrange peaches in a single layer on top of batter. Place in center rack of oven and bake for 1 hour. Serve with vanilla ice cream, whipped Cream, or a splash or heavy whipping Cream.